There are going to be times that you are walking off campus. Maybe you're walking with friends or maybe you're walking to work. Or your college could even be in a city where you're walking the same sidewalks everyone else that doesn't go to college is walking. You want to make sure when you are packing up your dorm necessities for college that you include dorm safety dorm items to protect yourself. You want to make sure you have dorm security items such as a dorm safe to protect your valuables, but don't forget about yourself! Along with your dorm pepper spray, there is another dorm safety item you may not have thought of - our Protector Dog Spray with Belt Clip. Our Protector Dog Spray is a dorm essentials product that you want to make sure you have with you when you're in a park with friends or when you're just walking outside campus. This college supplies product has a belt clip to provide convenient access so it is exactly where you can reach it when you need it. This Protector Dog Spray is also police strength maximum heat so if a dog tries to attack you, you will be able to protect yourself fully but humanely. This dorm necessity is the maximum strength allowed by the EPA and is absolutely humane so it won't hurt the dog that is trying to attack you - it will just protect you. 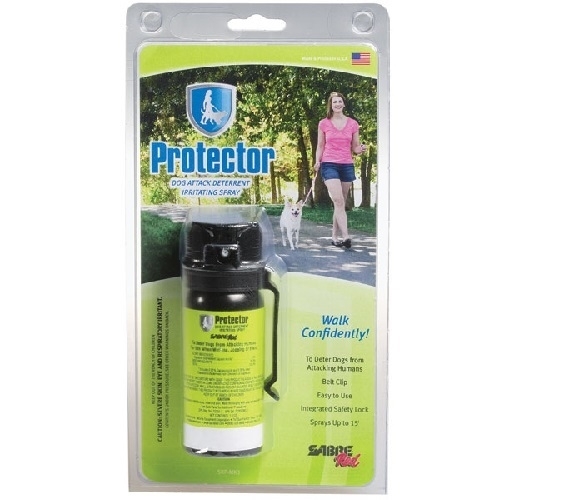 This Protector Dog Spray deters most dogs without long term injury or pain so you walk safer in the park or on sidewalks.